If you’re angry that America has more guns per capita than any other country or that we have five times more military contractors in Iraq and Afghanistan than we did in Vietnam, we ask that you turn out and support a power program on Memorial Day at the Illinois State Capitol. The theme for week three is The War Economy: Militarism and Proliferation of Gun Violence. The rally this week is on Memorial Day, Monday May 28 at 2pm at the State Capitol, 301 N 2nd St, Springfield, IL. People are already saying the work you did last Monday was among the most powerful civil disobedience they’ve seen in a long time. That’s why we’re asking you to show up and do it again on Monday, May 28th. RSVP here and we’ll send you a reminder email 24 hours ahead of the rally. 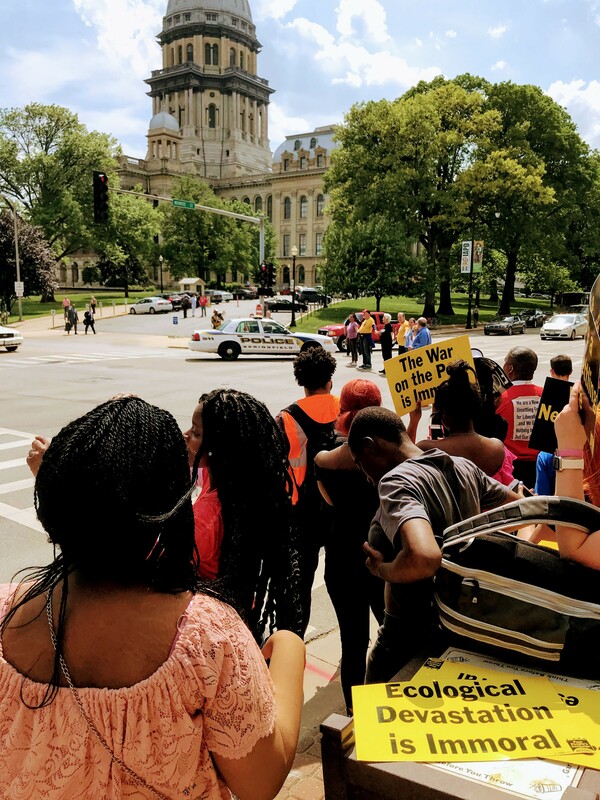 If you are interested in engaging in nonviolent moral direct action as, you are encouraged to participate in one of the Chicago training sessions. Trainings will be held Friday, May 25 and Saturday, May 26 at 6:00pm – 8:00pm. In person attendance is highly encouraged, however there is opportunity for remote access. Only those who have received training and signed the Covenant of Nonviolence will be able to participate in moral civil disobedience. You do NOT have to risk arrest to participate in this event. Space is limited. For planning purposes, please register here today. Are you interested in joining us in Washington, DC? Save the Date: Saturday, June 23, 2018 and pre-register here.